When it comes to skin care I'm a less is more kind of girl, some might call it lazy, I prefer minimalist. Right through my teenage years I had acne, there were a few times it got nasty, but even though I don't think I had a single week without a fresh breakout between the ages of 13 and 20 it never really bothered me. Sure I had spots, but I was a teenager, I was supposed to, right? Plus I tended to have singular, solitary lumps of red and ick, not so many that my entire face blended into one bumpy grease ball. I went through phases of trying different products that promised to dry me out but they tended just to leave my skin very dry but still spotty. Generally I left it alone: whatever face wash was in the bathroom, water, makeup remover when necessary. So long as it wasn't itchy or infected I figured my skin had a pretty tough job keeping my organs internalised and regulating temperatures, so I left it to do that and didn't fuss too much about the vanity aspect. 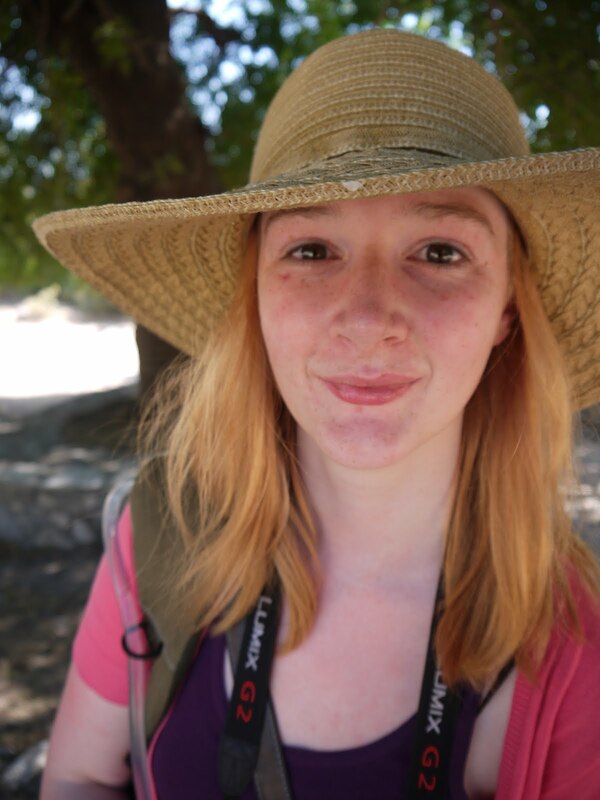 Now of course I look back on pictures of acne ridden teenage me and wonder why no one told me it was so bad, but I suppose I'd rather have had my glasses tinted optimistically than have been hysterically agoraphobic about blemishes. It seems to have settled down now anyway. More or less. Whatever. Can you see why I'm not a beauty blogger? Since discovering blogs I have become more educated about skincare, I have combination blemish prone skin and I now know that the products I bought for extremely oily skin in the hopes they'd erase my acne where probably the worst things I could have put near it. Years of using lots alcohol based toners and paint strippers (perhaps a slight exaggeration) have left me with a lot of redness that I've decided I'd like to reduce. I also had to change my hormonal contraception a few times in the past 12 months and all that messing around played havoc with my skin. Looking like a teenager as a teenager is fine, still looking like one when you're looking for graduate employment? Less so. The Eucerin DermoPurifyer range is specially formulated to care for skin that has been dehydrated due to the treatment of acne, making it absolutely perfect for me. The Hydrating Care day cream also has SPF 30 making it very sensible choice as sunlight can darken scars and blemishes making them more noticeable for longer. It's very light, absorbs quickly leaves my skin feeling hydrated all day, and doesn't really interfere with make up. A non-greasy, cruelty free facial suncream with UVB and UVA protection for under £10? I'm still waiting for other shoe to drop. And the bottles have pumps! Hallelujah! 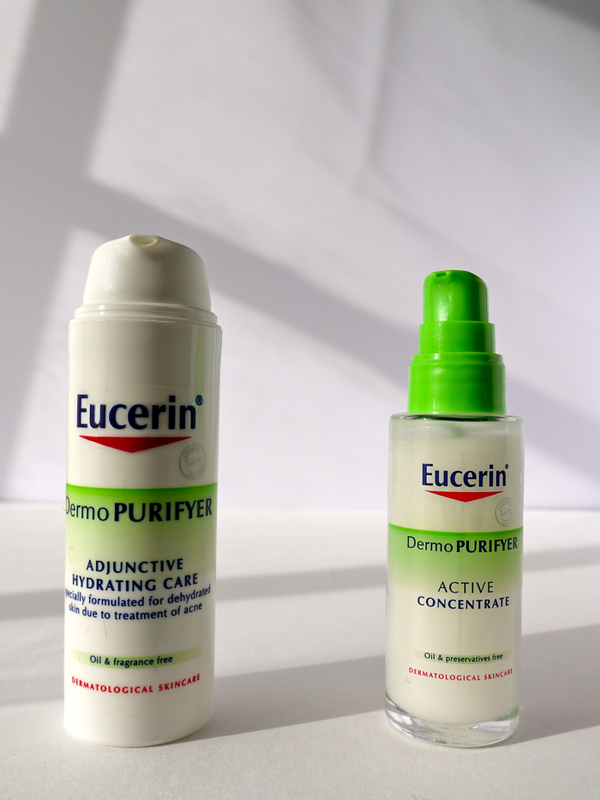 I use the Eucerin DermoPurifyer Active Concentrate at night before moisturising, it contains lactic acid which gently unclogs pores and encourages cell rejuvenation as well as antibacterial ingredients to prevent further blemishes. I only use it in the areas I feel I need the extra oomph, usually my chin and cheeks, if I use it on my forehead my skin ends up feeling very tight. You only need a tiny little bit, two pumps is enough for me so this little bottle is going to last a long time. One other thing to note, the Hydrating Care is fragrance free, the Active Concentrate is not and it stinks of chemical nastiness when you first use it, the smell doesn't last long and I got over it when I started seeing results. Since I started using them a few months ago I'd say my skin has improved, I've had less breakouts and they've tended to only last 24 hours rather than a week. The biggest change though is my scars have definitely faded, they're still present but they look like old acne scars rather than fresh ones and hopefully that improvement will continue. 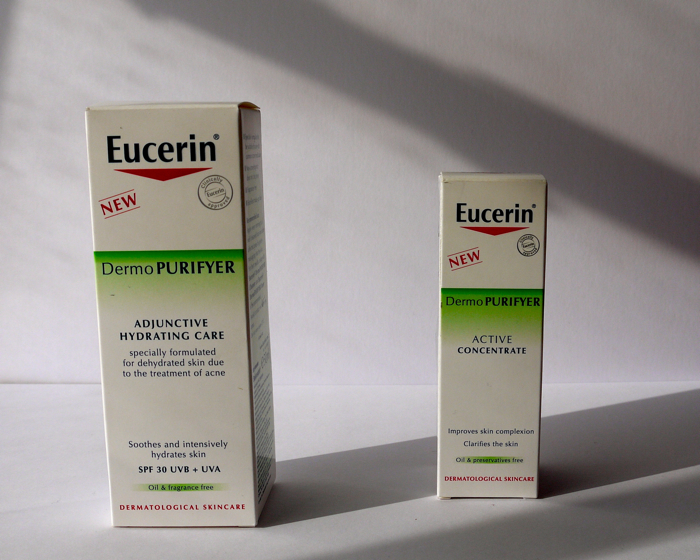 The Eucerin DermoPurifyer range is available at Boots and also online HERE.